Ok, new plan. We don’t eat an entire batch of cookies in one setting, and instead, make a tiny little cake which is full of the good stuff and eat that in one go. All aboard? Good. I give you a mini loaf cake with coconut flour, ground almonds, honey aaaaand dark chocolate (because I’m not cruel enough to leave that out). Moist, flavourful, good-for-you and so delicious! This cake sort of happened because I didn’t have all of the ingredients for this Ambitious Kitchen recipe. I was out of oats, so decided to replace them with coconut flour just on a whim. I didn’t have unbleached almond flour, so ground almonds is always my easiest substitute. And for some reason, I’m out of muffin liners so I decided to simply halve the recipe and bake it in my mini loaf pan instead. You can definitely double it, but I still got 6 generous pieces out of it. The cake is coconut-y in the best way, kind of like a macaroon, with a slight chewiness and texture. It’s sweetened with honey and can be made dairy-free. I’m not too sure about making it egg-free because the cake might be dense but if you have any luck with flax eggs or yoghurt or buttermilk as a substitute, let me know! The apple cider vinegar helps keep it moist but fluffy because (science break) it reacts with the baking soda and there’s all these fun bubbles happening to give it a lift. I probably should never teach science. The top is my favourite part!! The coconut becomes crispy and so you have this lovely crusty top to cut into and gooey chocolate chunks to remind you why you need dessert in the first place. Use a dairy-free, refined-sugar free chocolate if you’d like to keep this completely healthy. The cake is a little fragile when you first cut it, given that coconut flour and almonds don’t have much structure, but a little refrigeration firms the pieces right back up, nothing to worry about. I really liked it warm and cold, with a hot cup of tea. It comes together quickly which means cravings are satisfied quickly when means everyone’s happy and should be making this right now! Moist, tender coconut flour and almond cake with gooey chocolate chunks! In a small bowl, mix the coconut flour, ground almonds, cinnamon, baking soda and salt. Set aside. Preheat the oven to 175 C. Generously grease a 6x4 mini loaf tin with coconut oil. The cake sticks a little so don't skip the greasing. In a mixing bowl, whisk the egg, honey, milk, oil, vanilla and vinegar. Add the coconut flour mixture and stir to combine. Fold in the chocolate chunks. The batter will be thick as coconut flour is very absorbent, but if it's too thick to spread into the pan, add a splash of milk to help thin it out. Spoon immediately into the prepared cake tin and smoothen the top. Bake for 25 to 30 minutes, rotating the tin halfway through baking, until browned on top and a toothpick poked into the center comes out with only a few moist crumbs. Allow to cool for 15 minutes, then loosen the sides with a blunt knife and remove the cake from the tin. Let it cool completely before slicing. If the pieces seem fragile, chill the cake for 30 minutes. Happy eating! *Coconut flour can be substituted with oat flour. *I'm not sure if the eggs can be replaced here, the cake might become dense. But a flax egg or ¼ cup yoghurt may work. Let me know if you try! *I used 2 tsps of vanilla because I felt the batter had an eggy aftertaste but you can use lesser if you like. Hey! an I use almond butter instead of olive oil? If yes, what would be the measure? 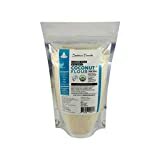 Is coconut flour the same as desiccated coconut?